This half day tour visits the old town of Bari and the mysterious Castel del Monte. After meeting your driver and licensed guide you drive to the old town of Bari. 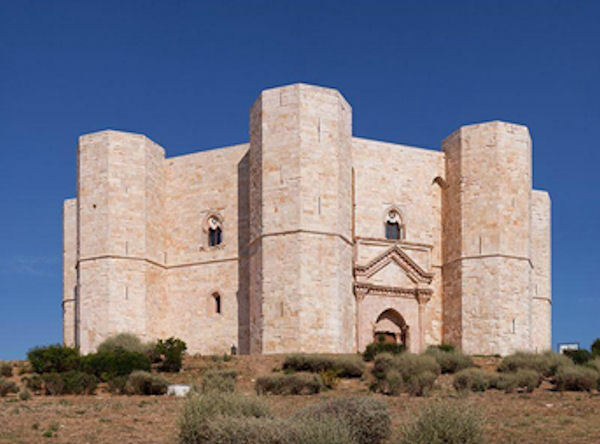 The Castel del Monte is a castle which was built by the Holy Roman Emperor Frederick II around the year 1240. Sitting on a hill at an elevation of about 1,600 feet, you will enjoy beautiful views of the countryside and the sea from here. There are many legends and myths about the castle. Some believe it was a defensive fortification but if that was the case, then why is there neither a moat nor a drawbridge. Others think it was a hunting lodge, but then why are there no horse stables. Maybe it was a prison or used as a place for refuge during the plague. These ideas may not be answered in your visit but you will enjoy the interesting castle which is an octagonal prism with an octagonal bastion at each corner. Each of the 8 walls has 8 rooms and the center is an eight-sided courtyard. The outer walls are each 75 feet high and the bastions about 80 feet high. In 1996, the Castel del Monte was named a World Heritage Site by UNESCO and today it is shown on the reverse side of the Italian issued one cent Euro coin. After visiting the castle you return to the pier in Bari. Remember to bring your camera. Please note: This tour is not suitable for our guests traveling with a wheelchair. This tour requires extended periods of walking over difficult terrain. Tour length might vary to fit ship’s scheduled departure time.